Tall, dark and handsome Cookie has had a long career in baseball. He was born 34 years ago in Oakland. Shortly after he graduated from Oakland Technical High School, the big league scouts saw him in an All-Star game against some major leaguers, and signed him up with the Oaks. He acquired his nick name from his Oakland teammates, who called him "Cookie's boy," because he had been hired by Oaks' president Victor "Cookie" Devincenzi. He made his first appearance in an Acorns uniform on April 9, 1933. By mid-May he had earned the starting position at second base. He batted in more than 100 games for an average of .312 that season. 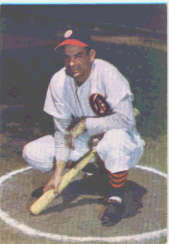 He moved to the big leagues in 1934, playing for Pittsburgh and Brooklyn, and making the National League All Star team four times in 1938, 1939, 1940 and 1941. 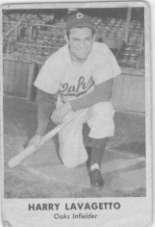 He served four years in the Navy during the War, and returned to the Dodgers in 1946. He played for the Dodgers in the World Series against the Yankees last year. In game four he came to the plate as a pinch hitter in the bottom of the ninth, with the Dodgers trailing 2 to 1. With two men on, Cookie drove an outside pitch off the right field wall for a two-bagger that broke up a no hitter and won game for Brooklyn. Cookie returned to Oakland this year, and has shared third base with Dario Lodigiani. Hit .304 this season. Bats and throws right.